MarcyMoji's uniqueness begins with the story behind it. Its makers are currently bicycling around the world, a journey they started last April in Southeast Asia and hope to continue for the next couple years at least. Throughout each day of their travels, Marcy uses much of the time needed for resting and cooling down to paint and sketch. One day, shortly after beginning their travels, Marcy had drawn a number of things resembling emoji, and the idea was struck to combine Marcy's art and Andrew's experience with programming to create something new altogether that could be shared with the world. Thus began MarcyMoji. The stickers in MarcyMoji are directly inspired by the couple's travels to this point, including things they've seen along the way, or things they miss from home. So there are stickers based on new places they've explored, like Bali and Vietnam, and there are also stickers that harken back to Southern California, where they both grew up. 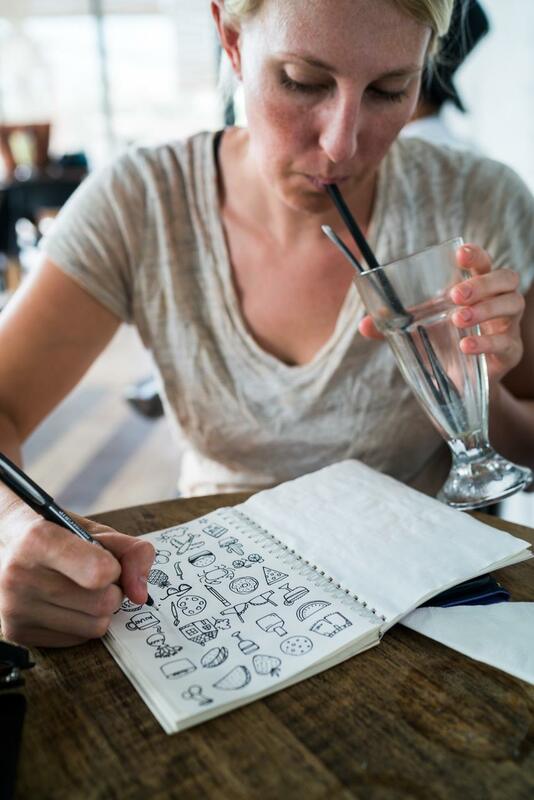 The array of new experiences they're immersed in each day are funneled into Marcy's work, which Andrew later adds to MarcyMoji as new stickers. Aside from the unique story behind the app, MarcyMoji is also unlike much of its competition in that it is not merely a one-off sticker pack. 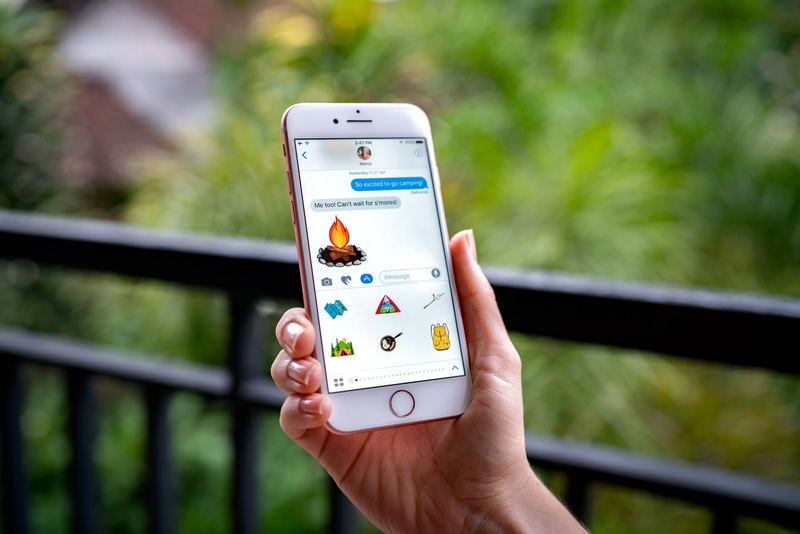 Because the couple continues to travel and see new things, they have gone the route of creating an iMessage app that is continually updated with new packs of stickers. Some of these packs are tied to a specific place they've traveled, while others fit broader categories such as Animals, Camping, Eats, and Faces. Current events also play a role in which stickers they add, as evidenced by the recent Christmas pack. 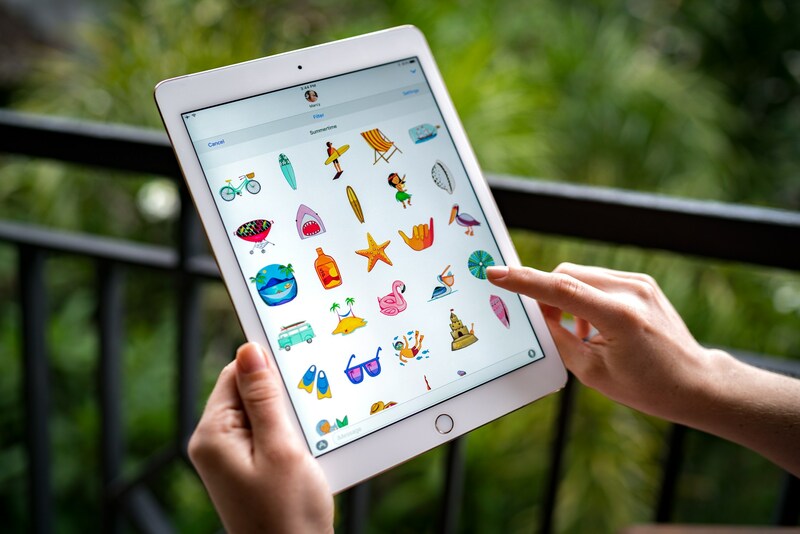 Because of the variety of stickers in MarcyMoji, and the plan to continue adding new packs each month, the app has adopted a freemium model. A free download of the app garners a starter pack of 30 stickers, while additional packs can be purchased for $1.99 each, or you can sign up for an in-app subscription for $2.99 per month to gain immediate access to all of MarcyMoji's current sticker packs, plus future packs as they're added. 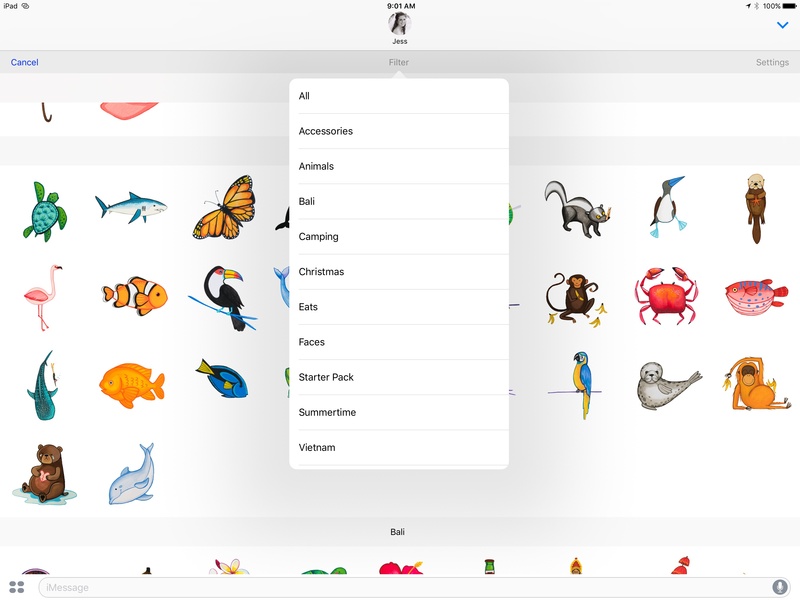 MarcyMoji organizes its sticker packs in a way that's quick and easy to navigate, with an interface I wish Apple would adopt in the basic iMessage drawer interface. Once you enter the full view by tapping the up arrow in the bottom-right corner, you can scroll through a vertical arrangement of all sticker packs, each divided by a visual header. Optionally, you can also tap the Filter button at the top to view a full list of packs and jump straight to the one you want. This interface isn't particularly flashy or innovative, but it gets the job done by making stickers quickly accessible in an intuitive way. Each of the stickers in MarcyMoji have been hand-painted by Marcy herself. After she paints them, Andrew photographs them and gives those RAW files to Marcy for touch-ups so that they look just right on mobile displays. After she completes her work and gives the go-ahead, Andrew adds them to the app. 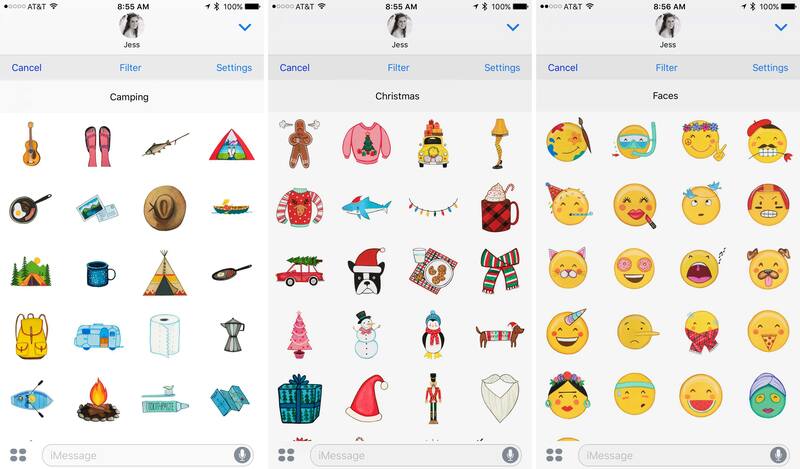 They currently appear to have the largest single collection of hand-painted stickers on the iMessage App Store. Building an iMessage app while bicycling around the world may sound romantic, but it is certainly not without its challenges. Marcy and Andrew bike for 6-8 hours a day, and all work on the app has to be done before or after that while using sometimes unreliable wireless service. Bug fixes have been uploaded over 3G from a roadside food stand in the middle of nowhere, and support emails have been answered from a mountaintop while awaiting sunrise. These challenges considered, Andrew shared that the couple loves the balance of being outside, traveling, and exercising mixed with working on something they're both very passionate about. Along with each new App Store introduced by Apple, a new crop of opportunities arises. MarcyMoji seeks to take advantage of that opportunity with a group of stickers that act as one couple's storytellers. Marcy and Andrew are chronicling their bicycling journey through stickers, and they hope to do so for the foreseeable future as new places are explored, new sticker packs are made, and more people share their adventure with them. MarcyMoji is available from the App Store as a free download . If you would like to follow Marcy and Andrew on Instagram, their app's account is @marcymoji , while each member of the pair shares more of their adventures at @marcydaypaints and @convenientlylocated .